You know that phrase “The eyes are the windows to the soul?” I believe this to be true. Looking into another person’s eyes, making true genuine eye contact – rather than our facebook messages or texting hellos – is such a REAL experience. Hit the jump to find out how the staff at Calma Salon made this experience that much more vivid for me. I love looking at other people’s eyes, and find eyes to be the first thing I am drawn to about another person. This may be a little self-serving, but, I love my eyes. The colors change – sometimes they are a blue green with a hint of yellow in the middle, and other times they are more of a green color with an orange brown center. Still to this day, I am unable to figure out what makes my eyes change. Is it my mood? The color of the clothing I’m wearing? My whereabouts relative to earth’s magnetic poles?Who knows! What I do know is that I love accentuating my eyes. I feel alive, awake, and pretty when attention is drawn to them. If I had only 2 minutes to get ready in the morning, I’d curl my lashes, throw on mascara, and brush my hair into a ponytail. I’d forgo blush, bronzer, eye shadow, and (gasp!) even a little deodorant – all in the name of curled pretty lashes. 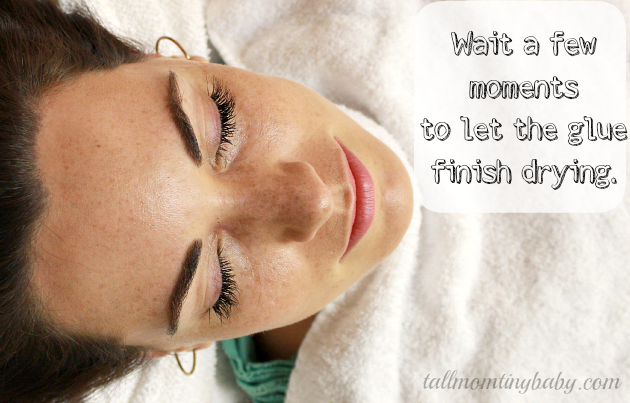 but your eyelashes are the window treatments. My eyelashes are stubby, stick straight out, and aren’t really pretty. 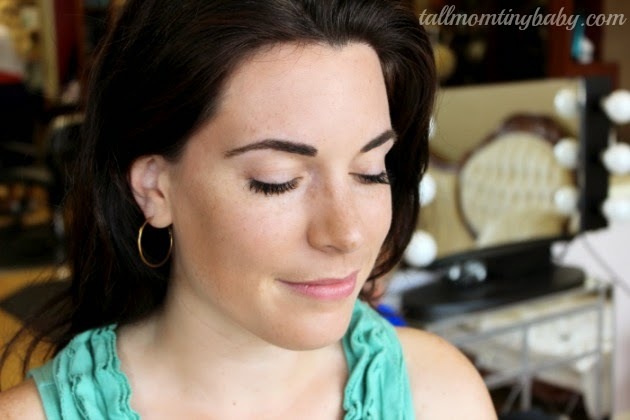 For fancy events, or if I’m going on television, I usually glue on a strip of fake lashes – which are perfectly curled, dark, and oh so feminine. The problem is, now that I have a toddler running around my household, I don’t have time to get ready in the morning, none the less carefully curl, mascara, and then glue fake lashes on with a steady hand. I’m too busy chasing around my cat (whom I’m convinced is a ninja escape artist) or making sure Itty Bitty doesn’t go all Godzilla on all of our lamps. But just because I’m a busy mom doesn’t mean I shouldn’t feel pretty, right? So that is why I turned to Denise Marchetti at Calma Salon in Cranston, Rhode Island. Calma Salon has a 100% bombshell guarantee, and they are a proud sponsor of Miss RI USA, Miss RI America, Mrs. RI America, Miss RI Teen America, and Miss RI Outstanding Teen. If they have helped keep pageant ladies like former Ms. Universe Olivia Culpo looking fabulous, then I’d trust them to make this Tall Mom look and feel like beauty queen. After dropping Itty Bitty off, I made my way into the beauty boutique. The salon was buzzing, women getting their hair done amidst friendly chatter filling the air. I perused the countertop which was covered in gorgeous jewelry. Denise, the (fabulous) owner of Calma Salon, greeted me with warmth and a cool beverage. 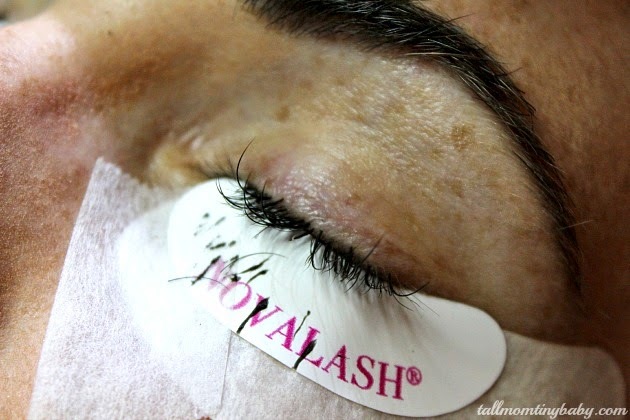 Denise went over the eyelash extension process, and why they choose to use NovaLash at her salon. After going through all of the proper NovaLash training, she explained that she prefers NovaLash because they are the leader in safe, beautiful, flawless eyelash extensions that enhance any woman’s natural beauty. 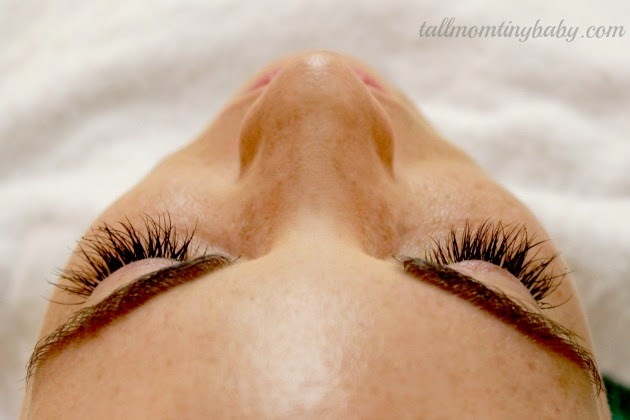 So what are NovaLash Eyelash Extensions? 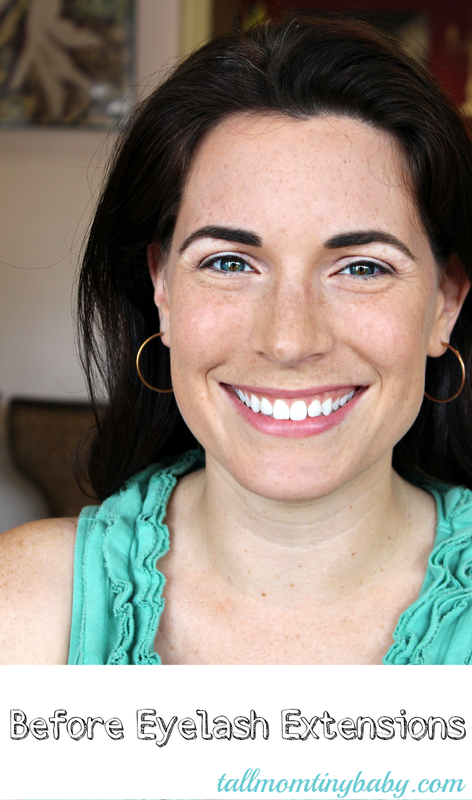 They are lash extensions that are worn daily – you don’t have to take them off each night. Each synthetic lash is bonded onto a single natural lash. You don’t have an awkward strip, and even close up – people wouldn’t be able ot tell the difference. It honestly looks like your natural lash. How Long Do NovaLashes Last? 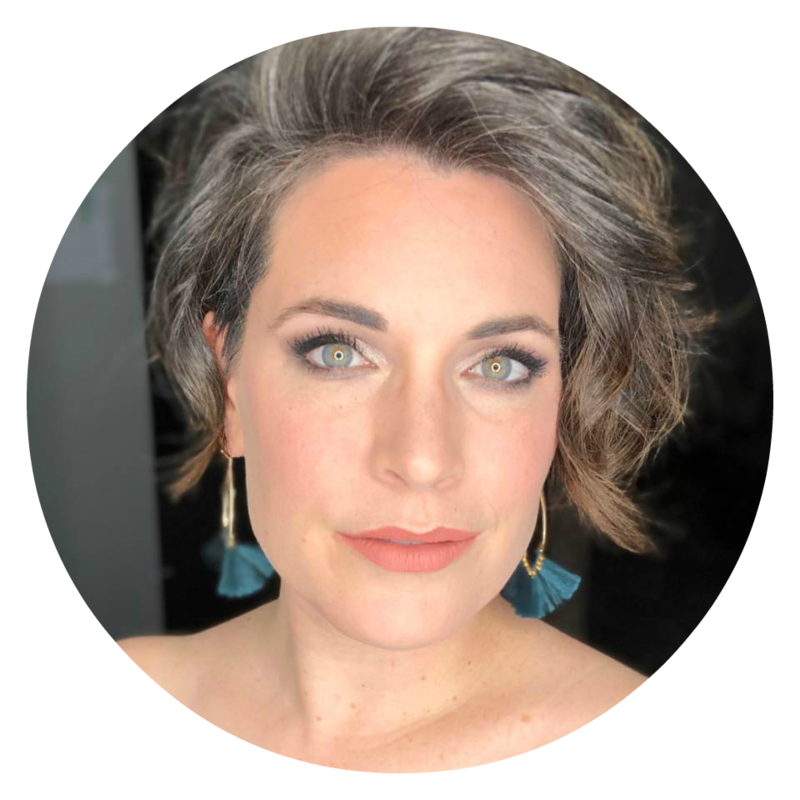 When applied by a certified stylist like Denise, NovaLash extensions can be worn all year with minimal monthly maintenance – it’s recommended that you visit your lash professional at least every four weeks. Think about it this way – your eye lashes naturally shed and fall off, and when they do, your NovaLashes fall off with them. When you go see Denise, you’ll be able to have her refill any lashes that cycled off. This was super important for me to know. I had worn nail extensions for a year or so in my late twenties, and they actually did some pretty bad damage to my nails. I was worried that lash extensions might do the same. 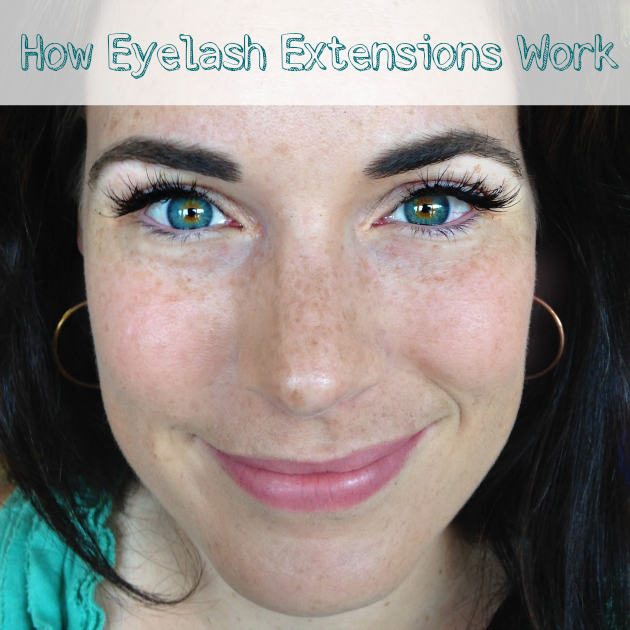 Denise (in addition to the research I did online) assured me that when applied properly, NovaLash extensions will not do any harm to my natural lashes. 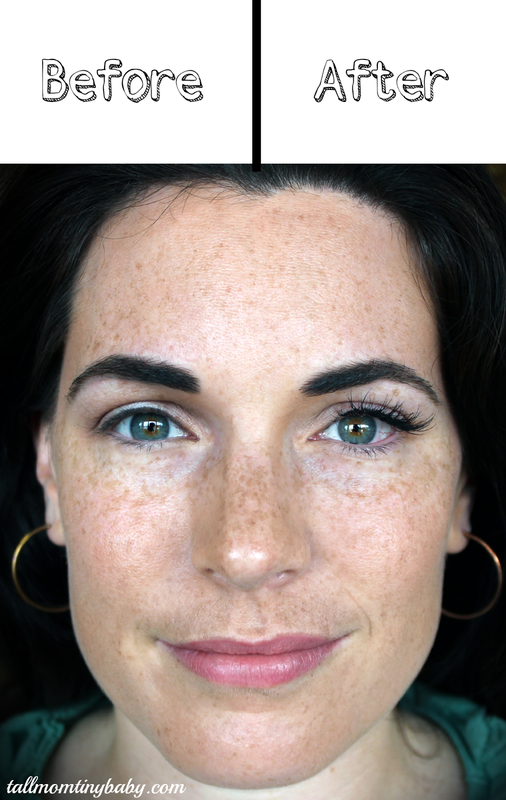 The reason is because of the application technique, when Denise bonds the NovaLash to a single natural lash. Since I will not be removing the NovaLashes, and I will just allow them to fall off naturally with the lash that they are bonded to, I will not be damaging my own lashes in the process. From the pictures I saw online, it looked like I wouldn’t ever have to worry about wearing mascara while my NovaLashes are on. I am allowed to wear all sorts of makeup, and Denise told me that I could wear water-soluble (not waterproof) mascara if I really wanted to, but it really wouldn’t be needed. Denise also told me that I would need to keep my new lashes conditioned to help extend their life. There is special NovaLash conditioning/cleansing pads, or I could even use baby oil. I she also recommended that I use a lash wand or comb to make sure the lashes were free of tangled. After learning all about the lashes, I was ready to get started! We made sure to take some before pictures. Look at my straight eyelashes! Ewww. I mean, awwwww. I laid down on the table, listened to the calm music, and Denise walked me through the process. She taped my lower lashes down so they wouldn’t get glued in the process, and told me to relax and close my eyes. I was a little apprehensive of my lower lashes being taped down because I thought it would feel really awkward. Uncomfortable even. But, I was totally wrong. Once I closed my upper eye lids, it felt as natural as closing my eyes naturally. For about and hour and a half, Denise meticulously singled out my lashes one by one and carefully glued a NovaLash to each one. The NovaLashes come in different sizes and lengths. Denise chose to use a variety on my eyelashes to give me a full bombshell look that I wanted. As silly as it may sound, I actually liked laying down for nearly two hours. Denise was incredibly fun to talk with, and I was able to take a brief mind-vacation. I wasn’t able to check my phone, didn’t need to be making dinner, worrying about Itty Bitty, or cleaning the house. My one and only job was to lie down and allow Denise to make me feel pretty. Once all of my nearly 200 eyelashes had extensions carefully applied, Denise removed the NovaLash tape, and told me to wait a few moments to let the rest of the glue finish drying. I couldn’t wait to look in the mirror and see the final results! When I did look in the mirror, I was blown away. They were long, lush, dark, and curled. I was so excited that I would be able to wake up each morning looking bright eyed and bushy-tailed, without having to spend any extra time primping in the bathroom. I felt pretty, and couldn’t wait to show them to the world. I am so thankful to the team at Calma Salon, especially Denise – for helping this Tall Mom feel like a beauty queen each morning when I wake up! These eyelash extensions are especially perfect for me because Tall Dad and I have a few weddings coming up, and doing my eyelashes (curling, mascara, glueing the strips on, etc) will be one less thing I need to worry about. Plus, my eyes look FABULOUS from the moment I wake up! What girl wouldn’t love that? 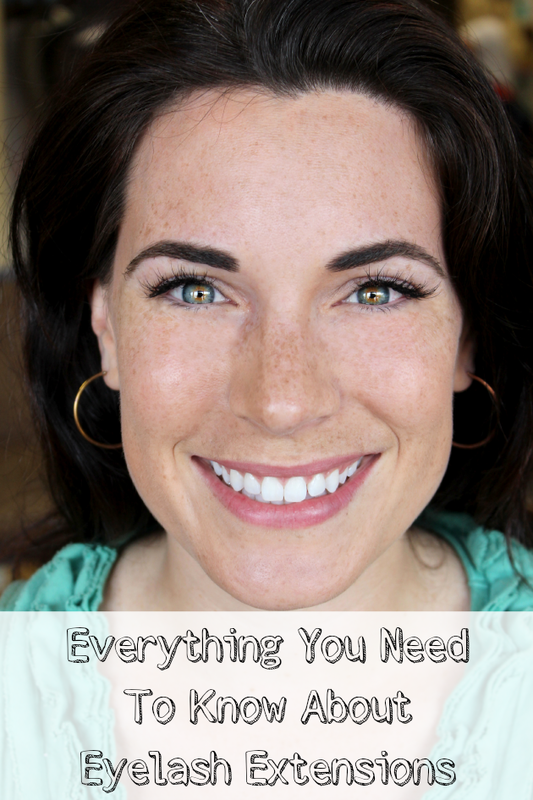 Have you ever had or thought about getting eyelash extensions? I love my Novalash extensions!! I really like these types of posts which are written in simple writing so that everyone can understand it, and everyone can understand what message does author wants to convey. The style of your is very unique but easy to understand what you want to say in this discussion. Feel free to visit top custom essay writing service (go to )for any king of essay writing. Thanks a lot for sharing.